This time, a tale based on the Fisher King, roughly. Our heroes are off to open trade negotiations with the kingdom of Quirkistan, but when they arrive, it doesn’t seem to be a very pleasant place. The state of the land, it seems, is affected by the king’s mood, and he’s been in a bad mood for a while. If you think this is bad, wait until you see what it's like when the king is angry. They try to cheer up King Mamoud, but fail. Jasmine, though, succeeds by telling him a story. He enjoys it so much that he declares that Jasmine will stay there with him forever. Though they escape at first, once Jasmine sees the harm that his anger is doing the people, she decides she must stay, for their sake. Ultimately, Aladdin manages to guilt-trip Mamoud into letting Jasmine leave, and the king discovers that he likes making others happy. Roll credits. Aladdin manages to pass of Iago and Abu as Jasmine's mother and father, in hopes of making Mamoud feel guilty. 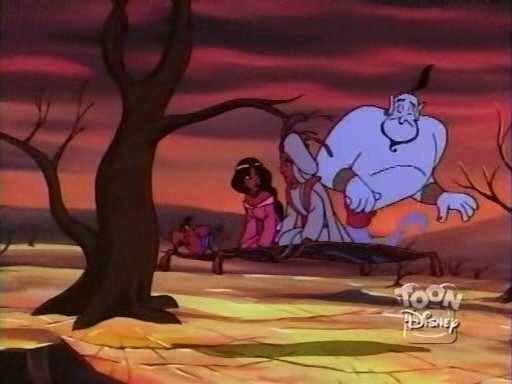 I’ve seen this episode quite a few times, but the sequence with Aladdin introducing all the people who would miss Jasmine is still pretty funny. In particular, the (identical) orphans are good. I feel like the ‘pet Wallaby Edgar’ was taking it a bit too far, though. 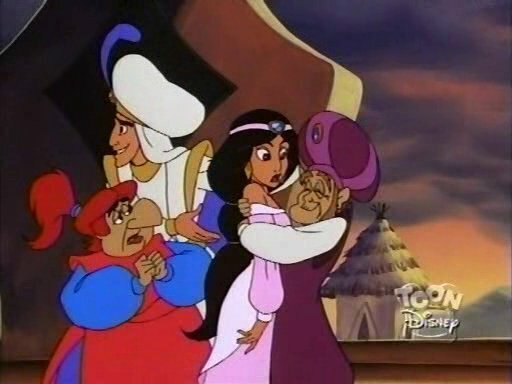 The episode is also featuring a little retelling of the story of Scheherazade, though it’s Aladdin’s ‘story’ and not Jasmine’s that causes the change in the king. Anyway, it’s always interesting (for me) to see a retelling of some old story, so this one is worth seeing. But, it’s not that great. Jasmine’s willingness to abandon her own kingdom for the sake of Quirkistan shows that she is kind, but she forgets that she does have her own people who might need her. Well, it all worked out in the end. Agrabah is attacked by thieving ‘wind demons’, though Aladdin doesn’t believe they’re demons at all. He makes a bet that he can prove it, and stands to lose Abu if he fails. 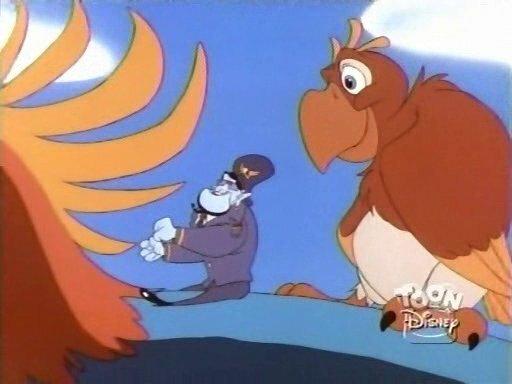 Ultimately, it turns out to be a group of thieves under the leadership of Abis Mal that is causing the trouble, using the power of roc’s feathers to protect them and cow their victims. This episode is very simple. Supposedly, the viewer should worry about whether Abu will be lost in the bet, but of course there’s no chance that this will happen, so it provides little tension. Having the roc’s mother save the day is about the most sensible thing they’ll ever do on this show, so enjoy it. The animation is capable, but the story is lacking. Not an episode I’d avoid seeing, but it’s not worth watching more than once.